My teacher hardly explained to me. He would just ask me: Why does this happen? I would say: I don’t know. He would reply: Go, go, go and practice. He never explained many things. But I wanted to know, I wanted to get the answer; so I practiced very hard. There was interest. First, I practiced the wrong way because I wanted to know badly. Slowly when the craving subsided, I learnt how to watch with interest; and then the answer came. It has become a habit for me to immediately ask “Why?” when something different arises in the mind. Interest; I want to know. This happens automatically. Yogis don’t know; so, I help them. Slowly, they learn how to practice with wisdom. My teacher didn’t help me by explaining; he just asked me and I would find out for myself with interest. And slowly when wisdom grows, the questions would come automatically. For example, you’re meditating very peacefully and suddenly aversion arises. Then, the mind asks: Why? Very interesting. The mind would watch again and again to see the whole picture; and then it realizes something. When the wisdom came, your mind settled down. I wasn’t talking about you, I wasn’t talking about anybody; I was talking about the nature of the mind, the Dhamma quality, not something personal. In the past, when I reported to my teacher about my practice, sometimes he would say that it meant that the samadhi or wisdom was good; and I would go away thinking that I was so wise or clever. It was many years later, on reflecting, that I realized that my teacher wasn’t saying that I was wise or clever, but that the samadhi or wisdom was good. Yogi: I know how to practice to have more awareness of what is happening, to enjoy life experiences more. But I also know that liking and disliking are both misconceptions. It seems that it doesn’t matter what I do now? So I ask: What is the point of meditation? Sayadaw: Meditation is to understand what is real, not, to get what we want; it’s a different attitude. Meditation is trying to change our view – if our view changes, the experience changes. Awareness is something – we get something from awareness. What can the mind learn from our experiences? If awareness is present, we can learn. 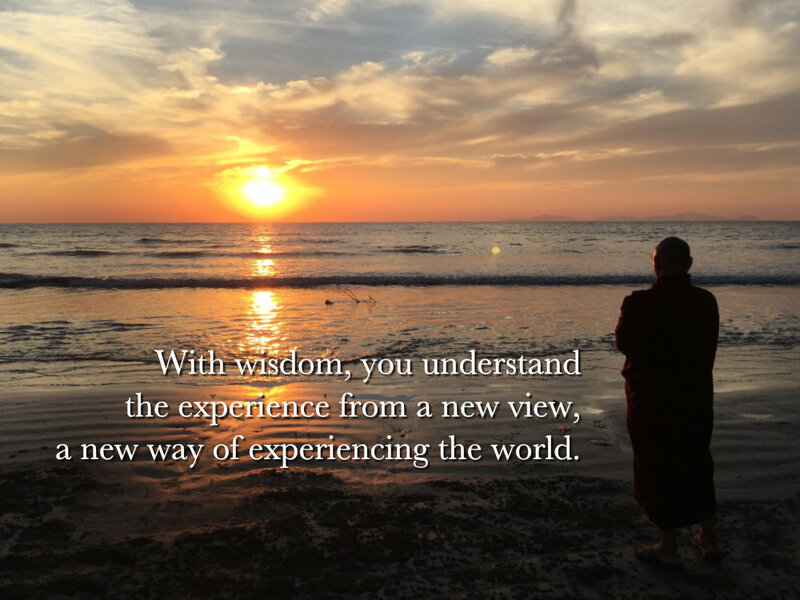 With wisdom, you understand the experience from a new view, a new way of experiencing the world. Wisdom and delusion are opposites. Wisdom, faith and right effort individually or combined, but wisdom is the strongest motivator for awareness to be present. Faith is actually a function of wisdom as well – to have right faith is a kind of wisdom and that automatically drives effort forward. There are some people who don’t have much wisdom or faith but they are good at efforting and they might just make the effort to be mindful and then develop some wisdom that feeds the faith and they carry on being aware. It’s like money – if we understand the value of money we make a lot of effort to make money and also in this world, you cannot do without money. So, you almost have no choice but to make money because you need it to survive. If we understand that awareness is also necessary to be wholesome, then we will make the effort to find awareness. There are 2 ways to bring awareness into the moment: put in the effort to be aware of the object or remind yourself to be aware. When we ask ‘Am I aware?’ it brings awareness to the present moment too. When craving is working, there are lots of problems. And many things go wrong. If I have wisdom, both body and mind are peaceful. Everything is alright and the mind is very satisfied. In time, the mind chooses the wisdom way. Whatever the mind says, you don’t believe in it immediately. Check first. Don’t immediately believe what the mind says. Investigation is not through active thinking, it is through watching. Like a detective – he doesn’t know the answer yet, he investigates first. Investigation (wisdom thinking) means to use some questions to be more aware, like a scientist asking: why is this happening? That’s it. Then the mind is more interested in watching the experience. Meditation is like research. We ask “Why?” to investigate and collect more information. Investigation means we try to watch the process more, not think of the answer. We collect more information, more experience. When the picture is complete, understanding arises. To end suffering, wisdom must be perfected to completion. Vipassana wisdom’s object is nature. When vipassana wisdom is complete, the magga phala wisdom arises in the mind. This mind’s object is nibbana. That is the end of suffering. Only wisdom can end suffering because mind and object must match. When wisdom is incomplete, the mind takes paramatha (nama-rupa) objects. Only when vipassana wisdom grows to completion and changes to magga phala wisdom, then it takes nibbana as object. Nibbana means end of suffering. Why does the mind suffer? Why is the mind deluded? How does the deluded mind work? You need to know the characteristics of mental states and nama-rupa nature then only can the mind understand anicca, dukkha and anatta deeply. First, you need to learn how to practice the right way. That in itself is a kind of understanding. When you apply that information and practice correctly, then you become more skillful in your own practice and deeper understanding can arise. That’s why it is more important that you learn how to practice the right way in a retreat. That’s enough. An experienced artist told Sayadaw that when she wants to draw something and she starts doing her art, it doesn’t come out satisfactorily. But when she is not thinking about what she wants and she just draws, it always comes out perfect. 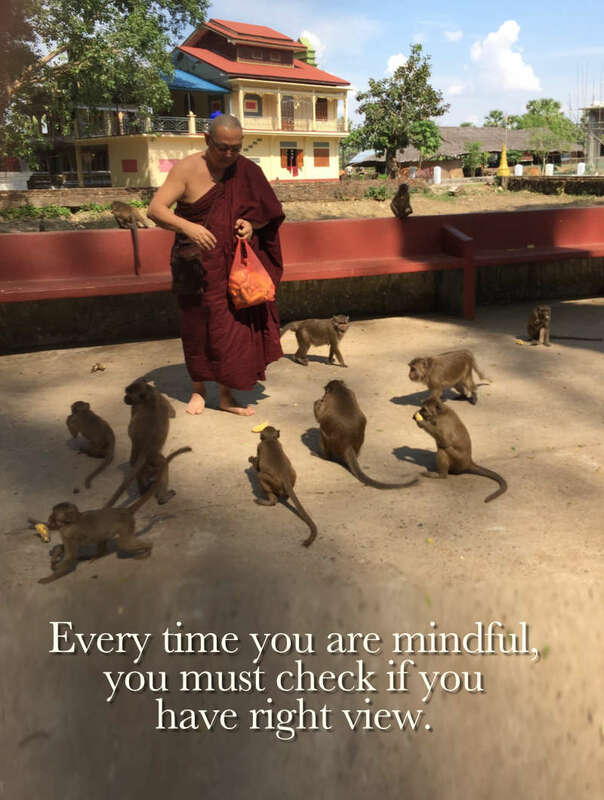 Sayadaw: You already have the skill; your mind knows what to do. What get in the way are the defilements (especially greed and fear). So when you clear the defilements, the wisdom is already there. That’s all to it. Your mind already knows how to draw, but when greed comes in to have it a certain way, then it won’t come out right because greed is in the way. So, you just take care of your defilements and wisdom will know what to do. An older yogi reported how the practice has started to fall into place. Sayadaw: A lot of people think that when they are old, they become more disabled. That’s not true, at least mentally. Actually with years of experience, as long as we’re not stuck to our views, the mind of the person when he’s older has even more wisdom available because of the years of experience. I talk about bringing in right view [yogi's note: that everything that happens is just nature at work; just mind and body processes] to help the mind to be more accepting. But often the mind cannot accept, the mind remains identified and at that time what we do is to recognize that; recognize that the mind is not accepting. Recognize that the mind is identified; and that is fine because that is what is happening now as it is. If we don’t accept, we don’t accept; that’s fine. We can’t try to let go. Letting go doesn’t happen because we will it, but what we can know is that letting go is not happening. This is the truth of what is happening in the moment. You know that craving is happening; so appreciate that - recognizing that you know your honest experience. We just need to know that this is our experience: seeing the mind creating smell, taste, desire for us. Letting go is the work of wisdom. When wisdom comes in and understands, letting go happens. Right now we are just acknowledging what is happening as it is. If the mind is not letting go, okay, the mind is not letting go; so long as you continue to be aware of the present moment experience. If you’re wanting to let go badly, then that’s another thing that you know, right? Know the craving to let go. There might be a little bit of understanding that craving in itself is not desirable, but there is not enough wisdom for the craving to go away; so, we are kind of get caught in a hard place, but you just need to continue to recognize that. The question was, there is a very subtle difference between cultivating good qualities of mind, and allowing what is manifesting to be there - allowing what is being experienced to be there and not trying to change it. The little bridge between these two is the word acceptance, which can be misunderstood. We often think that accepting something means surrendering to it. If there is anger in the mind, "Oh, I accept it so let my mind be angry." But that's not what it is. There is some extent to which you can't help but roll with it, because it has its momentum and you can't stop it. But what you are not doing in the present moment is feeding it. You accept that this is what is happening, but then you will do what you need to do, with awareness, you are going to be aware. You are not feeding it, you are not thinking more about what is making you angry. You are not making yourself angrier; you are trying to become aware, moment by moment. "There is anger, this is anger, and this is the nature of anger. What is that like?" And you are bringing that awareness continually. You are not working at being angry you are working at being aware. So that has to become very conscious, that awareness is at work. That is the good quality that you are cultivating. So you are cultivating awareness, not anger any more, although anger will have its momentum. Don't let it eat you. When we say "accept what is happening,” we are saying that you need not say to yourself, "I shouldn't be angry, I shouldn't be angry." Accepting is, "Oh, there is anger," and then there is awareness, and awareness is where you put your energy. You put all your energy into awareness. There is only awareness, awareness, awareness.